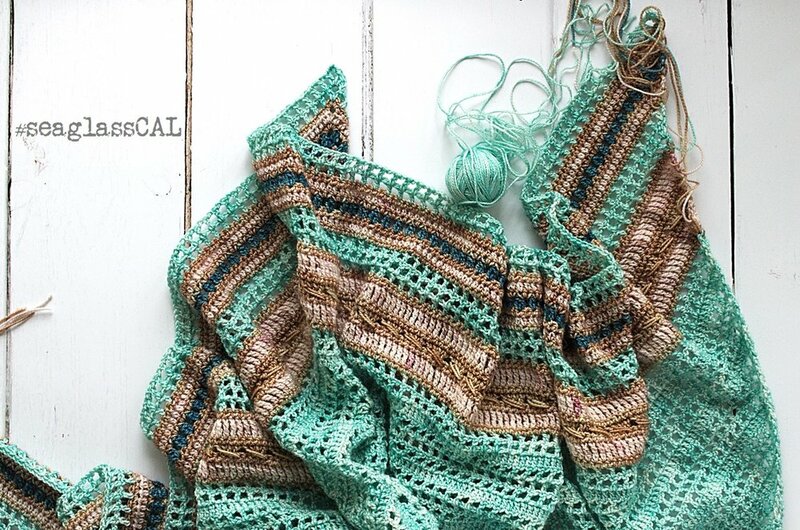 I'm so pleased to announce that there will be a Crochet-a-Long (CAL) for the Seaglass Shawl. If you've never taken part in one, they are such fun; You basically get to crochet along with a bunch of virtual friends, sharing progress update photos, swapping tips and solving hick-ups. There will be a dedicated Facebook Group for you to join. I'll try to check in myself daily, and generally be on hand to answer any questions, offer encouragement, and get to know you a little bit. I'll also have a few diagrams and step-by-step photos prepared, so you'll have access to those before they go up on the blog. If you're at all worried about whether you have the right skill level for this, therefor, don't be - a CAL is the perfect way to try something new with a bit of hand-holding. The group will be kept closed, which just means I have to approve each new member. It's a way of keeping things friendly, safe and spam-free. The CAL will officially run from Monday 7th May to Sunday 1st July, but I'll open the FB group on 23rd April so we can say hi and oggle each other's yarn. There's no pressure to finish your shawl by 1st July either; I'll leave the group running but I'll just be a little less available as the kiddos will be on summer holiday. To enter, simply leave a comment on this post stating which colourway you would choose. You can see all five of them at Fru Valborg's webshop. The giveaway is open worldwide*. I will choose a winner at random on 27th April, hopefully leaving enough time for the winner to receive their kit ahead of the CAL start date, should they want to join in. *Please note: I will cover postage to any location in the world, but if you are outside of the EU you may be liable to pay customs charges. Neither myself nor Petra at Fru Valborg can accept liability for such charges, should they be incurred.